In terms of outfits for the big day, priority will always be given to the dress, followed by the suit - this is the natural order of things and so it shall remain. Whether or not you’ve decided to go for the traditional morning suit, or a lounge suit if you’re all in the same jacket, trousers, waistcoat and tie you will stand out from the crowd and compliment the wedding theme beautifully. When wanting consistency for yourself and the groom’s party you’ll need to look to hire or purchase a number of suits from the same place. It’s always best to plan in advance, particularly with larger parties. Some people always struggle off the peg so I suggest you go bespoke and get everyone in for a perfectly fitting suit! Not straying too far from the first option, many grooms will want to stand out amongst the rest of the wedding party – just like the bride! The simplest way to stand out but still maintain the co-ordinated look is to add a contrasting tie. Whether you stick to bridal white, to match your bride, or you wear the flash of colour (stick to the wedding colour themes though!) it keeps the focus on the right man! Don’t forget - you don’t have to go for full suits for every member of your wedding party. If you’re getting married abroad or in the warmer months back home, the trouser and waistcoat option is also effective! 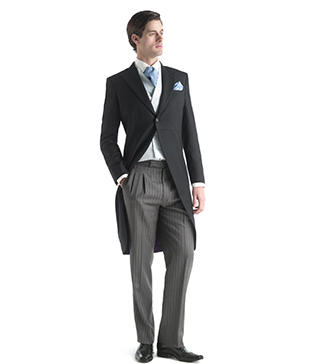 Waistcoats are a sharp addition the enable you to stand out from the rest of the grooms party. If having your own tie isn’t enough, then why not stand out completely? By grouping the outfits of your groomsmen they know they’re important and integral to the day, but then another tier is created for the groom! You could do this by dressing the groomsmen in a different colour suit or different suit design to the groom. This will ensure that the groom stands out from his groom’s party! If matching outfits isn’t for you, there are still plenty of options to ensure you have your groomsmen looking sharp. Whether you’re taking a more laid-back approach or you don’t want to spend too much on multiple suits this is a fantastic option. Picking a key item such as a bow tie or braces will enable the groom’s party to be instantly identifiable. This really is the moral of the story - regardless of the style, budget, size and shape of groomsmen, ensuring that there is one or two items that are consistent throughout the party will ensure you look great together. Wedding Suits - Some Top Planning Tips!